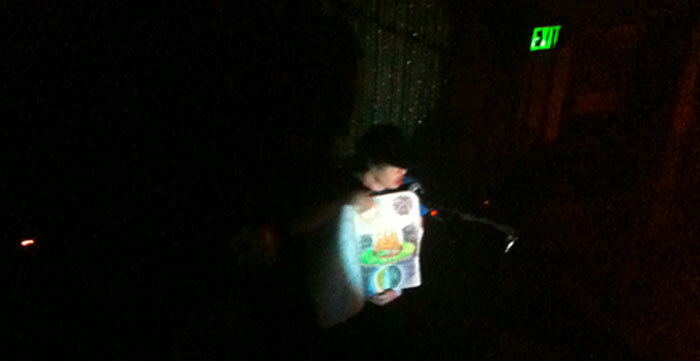 Jeffrey Lewis narrating as he flips through a portfolio of his drawings. What am I to do with every empty day? These lyrics are so bare and ham-fisted that you know somewhere there is a middle schooler scrawling a similar sentiment on a personal blog. This is emoting on a direct level, a one to one equation: “This is how I feel → I tell you how I feel.” The lack of sophistication in his words is fueled by drama, overripe with emotion. If you are the well-adjusted perennially happy sophisticated music listener then this music probably annoys you. But then again you, the well-adjusted perennially happy sophisticated music listener, do not exist. We ALL at one point hunger for those soggy achy songs. Especially when someone in your life leaves. When my relationship with my partner fell apart it was Lewis’s music that resonated with a sort of Euclidian logic. If you have ever experienced a break up you know that it creates a big empty space and it’s those bloated ballads that some how make so much sense—a giant circle peg in a giant circle hole. Naturally, when I had the opportunity to actually meet Lewis, I pounced. Feeling lost, alone, and lousy I was about to sit down with the maestro troubadour of feeling lost, alone, and lousy. I wanted to learn from his wealth of experience. I wanted him to show me the path through this twisted and dark post-break up jungle. I wanted Jeffrey Lewis to help me get over my old girlfriend. On the one hand, creating a single entity like a painting, a film, or a comic book can be a release; a one-and-done purge of all those gremlins. On the other hand, as a performer, a song derived from a well of pain will only ceaselessly conjure that hurt with each performance. I think this is the hand that Lewis is the most convinced of. He advocates for that initial impulse to capture emotions and lock them into words. It’s a crystallization that adds firm definition to emotions that, at the time, can be so amorphous, blobulous, and independent, harboring infinite potential for malice and terror. Encapsulating that experience in song and then hitting repeat offers separation from the painful source. More importantly, what is regained is a small degree of precious control---the one element that seems to evaporate in tandem with every relationship. So what did I learn from Jeffrey Lewis? Did he lead me out of the jungle? Am I cured? Am I totally over her? The short answer is no. And to be honest, I really didn’t expect for that to happen. He is not Doctor Phil. What I really wanted was context for my feelings. I could already relate to Jeffrey Lewis’s music but could Jeffrey Lewis relate to me? In the short time we spent with each other Lewis unconditionally convinced me of his honesty, charity, and here is a word: purity. What I wrote earlier about a one to one equation is emphatically true. After speaking with him I know that every lyric Lewis writes and sings comes unfiltered from a deep emotional reservoir. Every atom of pain, every smear of confusion, every spasm of anxiety is shared openly for those who care to listen. If you pay attention, when Lewis describes these grim psychologies you can understand it is the elocution of a native. This place, this jungle; Jeffrey Lewis lives here. All I can do is hope that I am just passing through. An edited audio recording of my interview with Jeffrey Lewis can be found here at the MIDNIGHT TALKS section of the The St.Claire.